We’ve covered the heating of old farmhouses so much already that if you are not in a house that is warm, cosy and cheap to run then you haven’t been paying attention. What about the Zombie Apocalypse though? If there is a power cut, all heat pumps, gas and oil boilers and most PV systems don’t work so a wood burner will be handy when the grid gets hacked, whether by Zombies, Russians or just bad weather. Connected to a heat bank that wood burner will provide heat, cooking, functioning radiators so not just a nice thing to have but maybe even a life saver. But enough about that. Not everyone has a leaky old house with a siphon attached to their wallet. The other end of the spectrum – a Passivhaus – is pretty astonishing with heat losses so low that just by turning on the lights, TV and computer would pretty much cover the heating needs. This diagram shows how energy demand falls as insulation values rise. The Passivhaus demands are so low that heating is hardly needed. It’s not just running costs that are trivialised. The actual build costs are reduced because there is no need for under-floor heating and no powerful heat sources to drive it. 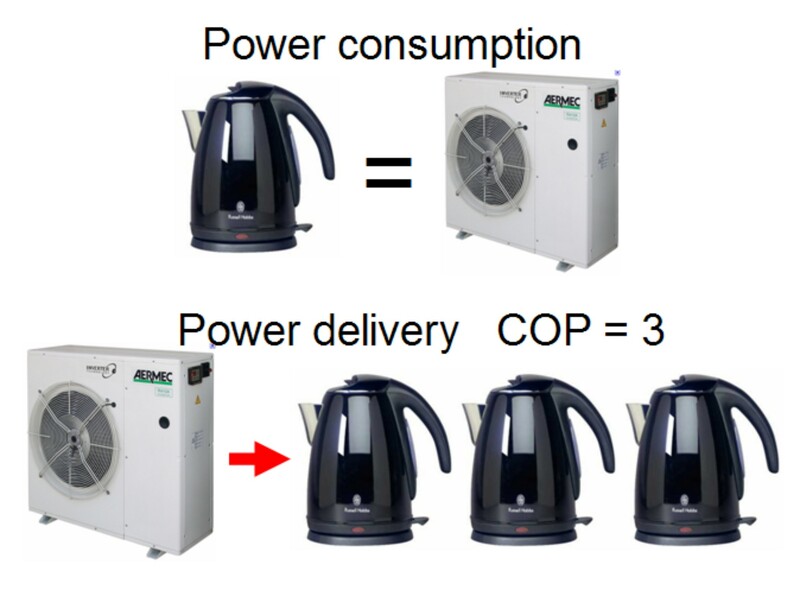 Usually a small heat pump using no more power than an electric kettle will be more than adequate. This is offset by the cost of extra insulation but the savings are there forever and the Government RHI will pay for the heat pump too. So what is a Passivhaus? It’s all about insulation and airtightness. Insulation of walls floor and roof have to be slightly better than current UK regs, but not by that much, and the building must be a bit more airtight than usual but again not by that much. Heat loss is measured by U values (which we’ll examine below) and airtightness is measured in air changes per hour. Basically a fan blows up the pressure to 50Pa for a maximum of 0.6 air changes per hour and then the same again but with a negative pressure. A Pascal is the pressure of one Newton/sq metre so a bit like a minced apple spread across your desk. 50Pa is very low so with careful building and lots of tape the standard is achievable. Sealed doors and windows will close with more of a ‘schmwuk’ noise than a clunk and the house will probably feature triple glazed windows and mechanical ventilation with heat recovery MVHR. 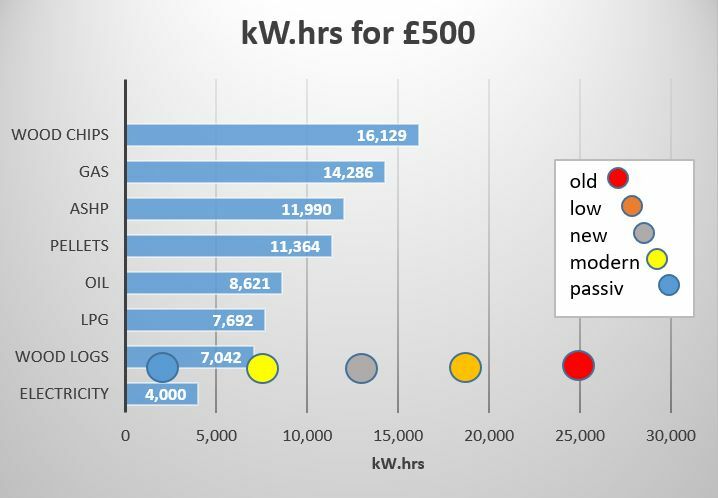 Passivhaus gradings relate to how much renewable energy they give back so for the top tier ‘Super’ the roof will be heavily covered by solar panels to make 120kW/m2/annum (footprint). The overall target U value for a Passivhaus is 0.15W/m2K so lets see how that compares with traditional practices. This value relates to the ability to flow heat energy across a surface so it is measured in Watts per square metre and takes into account the temperature difference across the surface, so W/m2K. So a Passivhaus with an external shell of 800m2 and U=0.15 would need 1.2kW when the outside temperature is 10 degrees colder. This ties closely to the Passivhaus limit of 15kW.hr/m2/annum (on the footprint) for total energy consumption. Note that some popular modern building methods are not really up to scratch and need extra insulation to get towards Passivhaus. Eg Durisol insulated concrete forms 0.15 Structurally insulated panels 0.14. Adding extra layers of insulation is needed and to get the final U value you add the reciprocals of the U values of the layers then take the reciprocal of that for the final figure. No doubt you have noted that glass is a five lane highway for heat loss especially on the North side of the house. 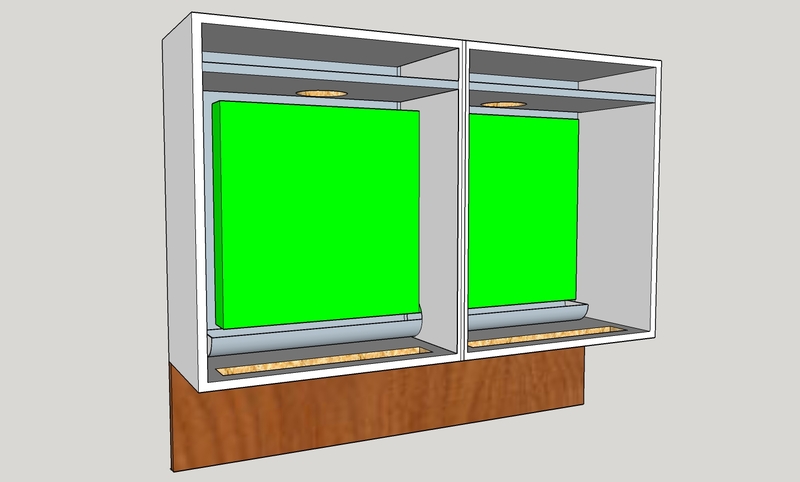 South facing glass is different because it behaves just like a solar panel and gives back much more than it loses. For example the daily solar insolation average in Kw.hrs per square metre (Brighton) is: Nov 1.7, Dec 1.14, Jan 1.43, Feb 2.17. The obvious conclusion is that lots of south facing glass is often good enough to heat the house especially if accompanied with high thermal mass floors/walls and covered at night with shutters and curtains. The RHI payments are good, it’s ecologically sound, it runs on similar power to an electric kettle and the PV panels will run it free on most days. Air conditioning can be incorporated when partnered with fan-coil units. N.B. There is no RHI for aircon enabled heat pumps so a separate chiller unit would be required. What about a wood burner? – well of course, we love them and there is the Zombie Apocalypse looming. No underfloor heating, no radiators, it has to be fan-coil units. There is a full description of the Original Twist version here. It’s a cheap and easy DIY project. Verdict: So good we have 3. Main uses, TV control, intercom, encyclopedia, alarm. Remember when a DAB radio with preset buttons was a Christmas present favourite? Well those days, in a flash, have gone. A Google Home will tune in practically any radio station; all you have to do is ask. Turn up the volume? “Hey Google, turn up the volume” “Hey Google set an alarm” So it’s a radio but, of course, so much more with your Spotify playlists to hand, and via Chromecast, control of the TV, Netflix, YouTube … etc … but you know all that. It’s just fascinating how as an almost inconsequential aside this device has consigned an ubiquitous bit of kit to history. Will the next generations even know what a radio is. That’s all for now. If you need advice, a stove or a heatbank in UK, France or Italy please contact me on the form below.